Get your costume and a really, really warm towel ready as the 9th Annual Freezin’ for a Reason Virginia Polar Dip is set for Lake Anne Plaza on Feb. 6. The event raises money to send children to Camp Sunshine, an overnight camp in Maine for kids suffering from the effects of life-threatening illnesses. 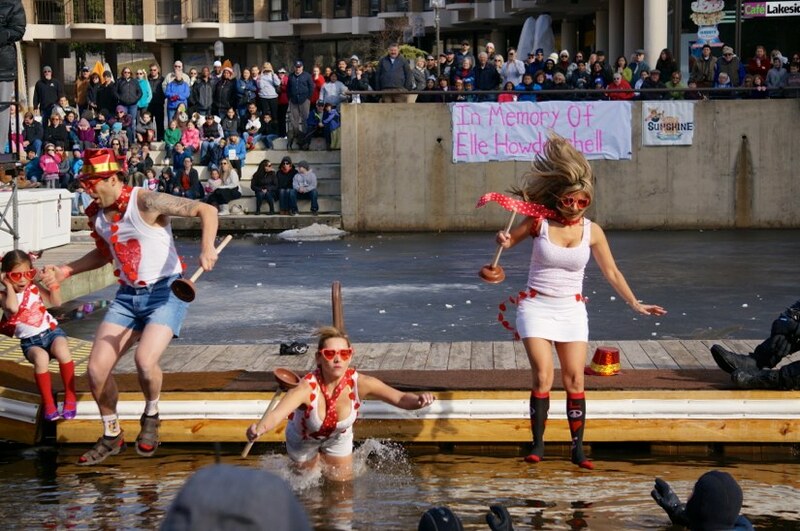 Closer to home, the Virginia Polar Dip is a popular community event, drawing hundreds of spectators to Lake Anne Plaza to witness the “dippers” — some of them in whacky costumes — plunge into the lake in the middle of winter. The event kicks off at 12:30 p.m. with music by Danny DJ, family friendly activities, and other warmup fun hosted by WASH-FM radio personality Chili Amar. The dip begins at 2 p.m.
Last year’s event raised more than $100,000. This year’s goal is to raise $125,000, which will enable about 50 Mid-Atlantic families to attend Camp Sunshine. The local event, one of nine Polar Dips nationwide, was founded in 2008 by the Toth family of Oakton, whose daughter, Jennifer, battled cancer. The event participation has increased over the years, climbing from 33 jumpers in 2008 to 338 in 2015. Organizers said they are hoping at least 350 dippers will register this year. Participants can do the full dip or just do the “chicken dip,” and stick a toe in the cold lake. Through pledges or self-sponsorship, each participant will raise/donate a minimum of $100 for the opportunity to plunge into Lake Anne, as well as receive a commemorative “I DID IT” event shirt. PetMAC Pet Nutrition Center — Donating 40 percent of all sales that day to Camp Sunshine, food excluded. Chesapeake Chocolates, Wine, Gifts, and More — Hosting a wine tasting, selling hot chocolate, and featuring chocolate polar bears along with their regular menu of fine chocolates. Small Change Consignment — Giving away hats, gloves, mittens, & scarves to all jumpers, and will hold its annual one-day-only, half-price toy sale to coincide with the event. Kalypso’s Sports Tavern — Donating 10 percent of sales from 1 to 4 p.m. on the day of the jump. Kalypso’s will also be holding a raffle for a big screen HDTV on Super Bowl Sunday and proceeds will go to Freezin’ for a Reason. For more information and to register, visit the 2016 Virginia Polar Dip website.